Three of us headed off on the Overland Track in late June, first off stopping for the mandatory photo at the magic new Overland Track sign. This sign will become an iconic image for the thousands that hike the track each year. Well done Parks and Wildlife Tasmania. Hannah, our mid 20’s daughter, was until then the only member of the family who had not hiked the Overland. This trip was her chance to experience our favourite place and join one of the many who have experienced this fantastic World Heritage area. 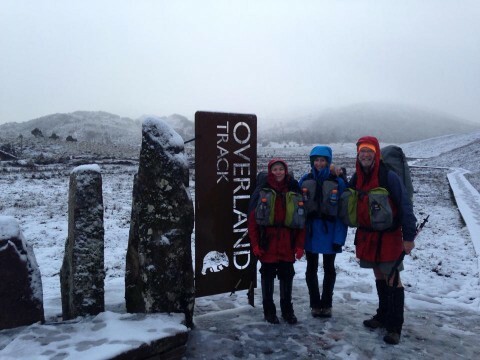 There are many articles around Our Hiking Blog about planning and hiking the Overland Track so this article will focus on some lessons others many find useful. If you want comprehensive information about planning the trip, arranging transport, selecting gear, planning meals and stacks of other information, check out our eBook – How to Hike the Overland Track. We walked in the first flush of winter. It had snowed for a couple of days and on the day we left there was a bushwalking alert. Not unexpected, so we were well prepared. 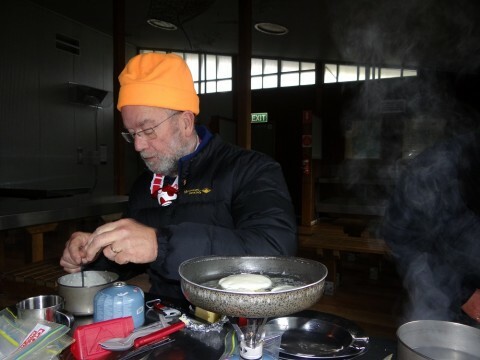 Breakfast at Pelion Hut – down jackets are in! Layers of clothing are winners. You get hot even hiking in snow and cold weather, so being able to remove (or add) a layer or two can make you much more comfortable. Down jackets are magic. They pack up small, are relatively light and oh so warm once you stop for the day and cool down. We all took them and had them on within 5 minutes of reaching the huts at night. Don’t over pack. Think carefully about what clothing you really need. Even though it is winter, if you have good waterproofs your inners should stay (relatively) dry. two pairs of gloves —- in total, that is a LOT of weight! Each morning, before you pack up and start hiking , pop your head out of the hut and check out the weather. Is it raining or snowing? Is the wind strong and are there black clouds on the horizon? Is it freezing cold? If any of the above exist, and you plan to stop for lunch along the track that day, think about how you will access and prepare your lunch. Prepare wraps or dry biscuits and toppings like cheese and salami in a zip loc bag ready to grab at a stop. They need to be easily accessible and not in the bottom of your pack! There are protected areas from the wind and rain, and a cup of soup or coffee might be great. Have your cooker, cup and a pot right at the top of your pack ready to pull out and fire up some boiling water. Have your scroggin or snack bars in the pocket of your coat and remember to eat them regularly. Just a few jelly beans or nuts will give you almost instant energy when you are struggling against a bank of sleet. You can almost feel the energy flow through your body! Oh the frustration and sadness of seeing a pair of hikers up and leaving a hut pre-dawn to get on the track. 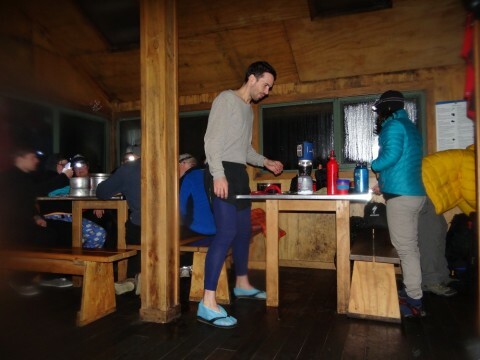 Alternatively, while we were having breakfast in Bert Nichols Hut at 10 am, greeting a couple of hikers who had walked the first hour in the dark to get there from Kia Ora hut, made us question what was the purpose of their walk. A time trial or one of relaxation and enjoyment? You don’t see these little jewels in the dark. Why rush? Why hike in the dark? Ok, many people love the physical challenge of a long distance hike. They want to burn the miles and achieve their goal of “doing” the Track. Fair enough but what are they missing out on? We had allowed 6 nights for this trip. The standard is usually 5 but we allowed an extra night in case of bad weather or heavy snow. Even though the weather was ok we still stuck to walking from hut to hut each day. Some days were only 3-4 hours walking so we often left at lunch time and arrived in the next hut well before dark. It made for a very relaxing trip. 4. Expect the huts to be full or busy at any time of the year. Think again, it was VERY busy during our trip. It was school holidays in a couple of Australian States but there were also people who thought it would be quiet. Around 20 the first night at Waterfall Valley in the new hut. There were also a few in the old hut. The least we had were 9 lovely people at Kia Ora Hut. We will be publishing a “hut etiquette” article in the future. A few people should have read it before they shared the huts! After long consultation with other walkers on the track we decided “waterproof” boots are a myth perpetuated by hiking shoe manufacturers. Nearly everyone had wet feet for most of the Overland Track. It is possible to avoid some of the deeper mud and water but not ethically right. You can ‘rock hop” or go wide on tracks but it only leads to track degradation and ultimately you will slip and get wet feet. Some tried plastic bags others just accepted it! Wet feet are a certainty. Some people tried to dry their sock and boots each night, not sure how successful they were. Frank just put on wet socks, wacked his feet into wet boots and took the icy cold hit. Sue and Hannah spent some time drying their socks but usually ended up wet after a couple of hours. Our new friend Dave (above) tried plastic bags that failed 5 minutes after the photo was taken……..
Winter is a great time to take food that would usually spoil in summer. The air is cold and conditions perfect to carry some fresh supplies. As usual, we ate pretty well on the track. Fillet steak and pepper sauce was a highlight on the first night after a very hard slog through ice and snow. 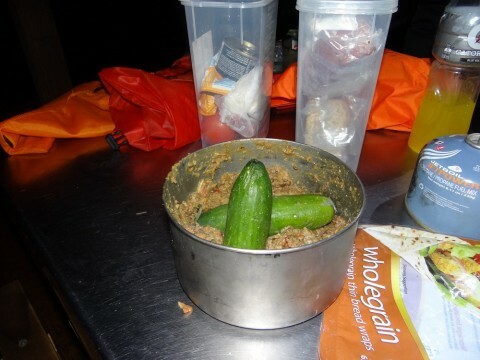 Cabbage lentil chow dahl with damaged and uneaten cucumbers ready for the composting toilet. With little opportunity to sit outside and enjoy the views, or bask in sunshine, having tasty meals and snacks can keep your morale high. We took a couple of serves of pancakes, packets of honey and jam AND a slab of butter. Delicious! It gets dark early in winter and the light was still weak until about 7:45 am. Most of the huts don’t have huge windows as they are designed to keep in the heat, not let it leach out through glass. That means you often need to use your headlight in a hut. Windemere Hut and a group playing cards under headlight. You do need a good reliable headlight. It is probably something worth not compromising on. Consider one that has a good strong spotlight beam in case you need to hike in the dark to get to a hut. Many people also used red lights to protect their night vision. A handy option. 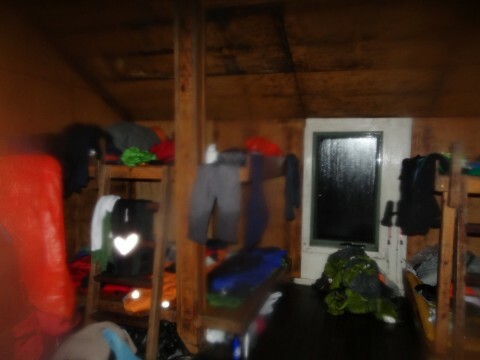 Yes it was winter, yes the Overland Track Huts have heaters and yes it was cold. But do they work? Not all of them do. Do they warm up the huts? No not at all. Do they dry your clothes and boots? Some of them, maybe. Heater at Bert Nichols Hut. Special. On this trip we discovered the fires in Kia Ora and Bert Nichols huts have been replaced with gas heaters. Excellent. The small problem was that neither worked. There was gas in the tanks but neither heater would ignite. Is it a disaster? Should we write a letter of complaint to Parks and Wildlife Tasmania? Is it their responsibility to heat the Huts? Our view is that we decided to bushwalk the Overland Track in Winter. It is our responsibility to ensure we have the correct gear and warm clothing. It is up to us to ensure we stay warm and comfortable. 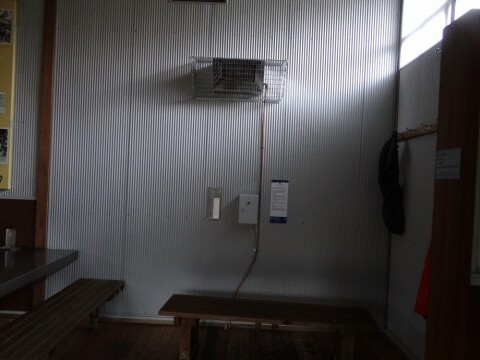 It is not Park’s responsibility (at great cost to the Tasmanian people) to provide heaters to keep us warm. A bonus if the heaters work? Yes! 9. Yippee it’s free in winter! Let’s “do” the Overland and save some money. We decided to hike the Track in Winter because Sue is a teacher and we are stuck taking our breaks in school holidays. We also love the challenge of walking in variable weather and always have our fingers crossed for “blue bird” days. The dream of stillness, blue skies and a white, winter, wonderland is always in the back of our minds. There were three of us so it did save us $600 on track fees. A substantial amount. The total? You work it out, it’s too scary for us! We have never been obsessed with lightweight or ultralight bushwalking. Sure, we have been careful in our gear selection and made sure it was as light as possible and especially versatile. We never double up gear with others in our party and try to share the load where possible. This trip we both bought new Aarn backpacks. There is a lot of interest in these and a full review article will follow. The Aarn packs were around 1.5kg lighter than our One Planet Strezlecki’s. This combined with new, lighter, One Planet sleeping bags (review to follow) saved over 2kg each. That is a significant weight loss and made the trip so much easier. In short Frank found his new pack excellent. Very comfortable and managable. The reduction in weight was fantastic and there were no sore feet or blisters on this trip, a first! 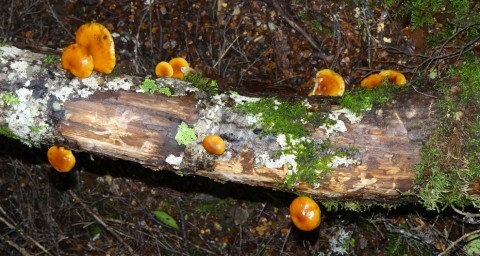 That being said, winter is a fantastic time to enjoy the Tasmanian wilderness and we had a brilliant time. We have also posted a few more pictures over at our Facebook page you might enjoy. Excellent tips. Especially enjoyed nos 3 & 6. What’s the rush??? And how awesome is an unnecessary treat on a long afternoon/evening in a hut? Hope you took your snow-shoes!?! Thought you were going from South to North Frank? Wondering if you guys have ever contemplated hammocks for sleeping? In addition to tip number 2, I carry a small thermos, which starts out as a port receptacle and once empty is then used to carry boiled water. This makes the lunch stop very easy as there’s no need to get out cooking equipment and allows you to have either a ‘cuppa’ or a mug of hot soup, very invigorating! For me, the sights, sounds and smells of dawn on the track are some of my fondest memories. Well written and great tips! It was lovely meeting you and your friendly family on the track Frank, and I look forward to the upcoming reviews (particularly the Aarn ones – we already have a One Planet sleeping bag!). I would also be interesting to read your thoughts on hut etiquette: I noticed a few snide comments about (I presume) my sister’s loudness (or perhaps mine – “the constant drone of the redheaded lass” could refer to either of us), and was a bit shocked that people hadn’t simply asked her to lower her voice in person, but rather thought that passive-aggressive comments in a log book were more appropriate! Thanks for the article. 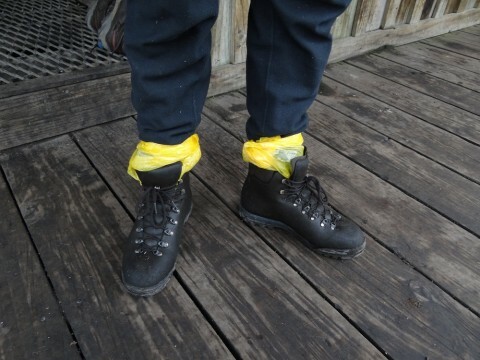 I’m not sure I agree with your comment about waterproof boots though. 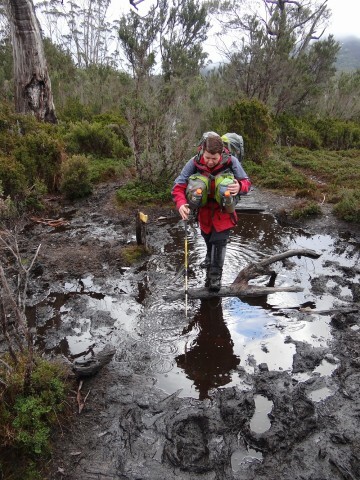 Whilst I accept wet feet are part and parcel of the overland track in winter I still think they are essential as they allow you to walk the centre of the track most of the time and this prevents further erosion. You’d be surprised how many times there is something solid beneath the murky water. Fair enough about the concept of waterproof boots, the discussion we all had was “are boots actually waterproof”? – of water running down into the big hole at the top? – water seeping in through the “waterproof” layer? – just feeling wet because of sweat?? Not sure but definitely need to keep to the middle of the track or it will end up being 4-6 metres wide. A bad thing. Agree with your comments about having to be prepared. Last year doing the OT South to North in winter we got up out of waterfall valley on our 5th day and faced 100kph wind (according to BOM and I’ve no reason to doubt it) and thigh deep powder snow which made progress too slow – we had to escape over the cirque down into Scott Kilvert Hut. The next day we walked out on the East side of Cradle Mtn down over Hanson’s Peak which was covered in ice – I mean covered in 30mm or so of clear solid ice and the track down Hanson’s Peak is very steep with a chain to assist walkers. We had Microspikes and having them made this so much safer. – I wouldn’t want to have tried it without them. It can be really windy and tough walking once you get out of the protection of Waterfall Valley heading towards Cradle. Good option to break down to Scott Kilvett. We have not been over Hanson’s as Sue is a bit adverse to heights and drop offs. I suggest you would have been hanging on to that chain pretty tight! Interesting about the boots. I purchased a pair of DANNER high top Goretex boots from Platypus in Little Bourke Street, Melbourne, and walked the Track. Have used them in many other places and found them to be very good in wet conditions. Have trekked through streams with them and had dry feet. They are light and very comfortable. Platypus supply military & security merchandise. Might try to look outside the box when it comes to gear. I’m ex-Army, so tend to check out all options. A good read about your trek. A good book for info is LIGHTWEIGHT BACKPACKING AND CAMPING by Ryan Jordan. Cheers, Trevor. Did the Overland July this year and talked to a ranger along the way re the gas heaters. The reason they don’t sometimes work is due to the fact that the gas tap is automatically turned on by a battery operated arm. The battery is charged by the solar panels that you see on top of the majority of the huts. As you would know many days on the overland are short of sunshine and as such the battery will not charge or will have minimum charge for only a few ignitions. We also had contact from someone from Parks re this issue. He did a trip down the track recently and recognised the same issue. i.e. the solar panels in winter are often not getting enough sunlight to charge the battery over winter. He did inform us that an additional battery will be added at the relevant huts during this seasons helicopter drop. Should fix the problem! Great post Frank, really enjoyed reading it and looking at your photos. I’m doing the over land in November and am currently assembling my gear. Im looking at buying an Aarn rucksack (freedom featherlite) so would be very interested in your comments on your packs. Are you still doing a review? We did some videoing yesterday of the pack as part of the review. Will need editing and words around it. Give me a week or two, it will be a bit of an epic. In short, I was very happy with it! Hi Frank, how’s the aarn review coming along? I went ahead and bought the featherlite freedom now but still interested in your comments. Soon Tom, soon! Have done the video, just finishing off the words. Great Tips Guys! I’ve done the track before (about 3 years ago) but am planning on doing it again. I want to go at a time of year where we are likely to see some snow but also some sun, what would be the best time? Fantastic article! I actually read this just before heading down to do the track for the first time in winter, and took all your great tips on board. Found lots of snow and ice (microspikes = awesome!) and luckily the weather held up great the week I went through. The gas heaters were working again, not that the strangely placed one in Bert Nichols was much help! Looking at your pics again makes me want to get back down there… simply amazing! Great to hear from you Rob. Those microspikes are magic hey?? Really pleased t=you had a great trip and weather. Itching to get back there myself! Just doing some ‘gaiter’ research for my son who is taking off to do the track with his girlfriend in a weeks time and was taken by your photo all sporting the Aarn packs. I walked the camino with my aarn pack and absolutely loved, loved, loved it! It challanged a lot of others walkers of their perception of whata proper pack looked like and I was known as the lady with the funny pack but hey, I was comfortable, had easy access to guide books, water, camera, lippy etc. Think I might have to put this walk on my bucket list! Good stuff Carmel. Glad you loved the pack! The Camino must have been a great adventure. Wack the Overland on your list, it is great fun …..
What a great read! I’m gearing up to tackle my first (!!) Overland Track trek early next year and had a quick question about bringing foods that I dehydrate myself into Tassie. I’m assuming from your cost breakdown above that you’re based in a state other than Tasmania – do you have any probs bringing non-commercially packaged food through customs, either at the airports or as the ferry docks? Thanks for so generously sharing your experience and knowledge with us – it’s much appreciated. I feel like I’m halfway there tackling the Trak just by reading through your blog!